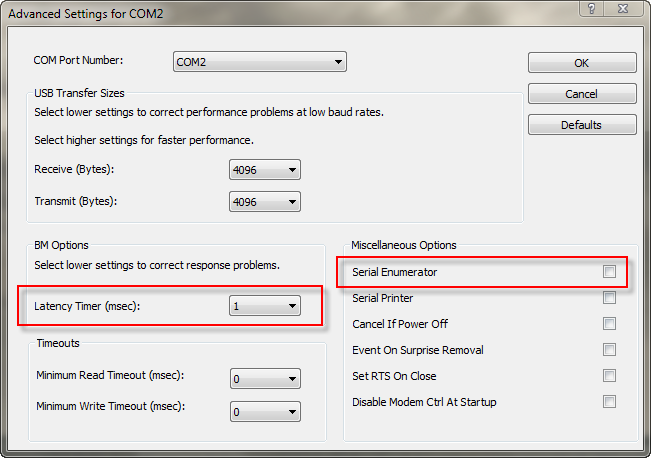 If the virtual serial port parameters below are not correct, the monitor software will exhibit a significant lag behind what's going on the amp front panel. The latency timer and serial enumerator not being set correctly account for 95% of all support inquiries. Unfortunately these aren't set-and-forget parameters as these can be changed by reboots, Windows Updates and FTDI driver updates. The first step is to double-check the latency and serial enumerator settings even if these were previously set correctly. The easiest way to determine everything is functional is to flip the OPR / STBY switch. If the monitor software doesn't immediately reflect the switch position change, check the virtual serial port parameters. Close the monitor. Unplug my USB cable and plug it back in. Retry the monitor. Close the monitor. Unplug the amp mains, wait a few seconds, and plug it back in. Retry the monitor. If none of this works, then it's time to verify with Hyperterminal, Putty or similar terminal emulator whether it's the monitor at fault or the virtual serial port. If you have the terminal emulator configured and can't get a > prompt when hitting enter or just getting "A minute has passed" without typing anything, then the problem is from the FTDI driver back. I will come up with a programmatic way to sense and possibly correct the port parameter problem and maybe even disable/re-enable the virtual serial device in the future. Stay tuned. There's now a support forum available at http://forum.ae9k.com. The forum utilizes Nabble, the same forum engine used by Elecraft. A note about Nabble user accounts: If you already have a forum account set up, that account is known only to a single forum. So, if you have a username, email and password registered for the Elecraft forum, that account won't work with the Alpha Monitor forum. You can, however, re-use your username, email and password each time you register for a different Nabble-based forum. It's counter-intuitive for those used to registering once for something like a Yahoo Group where that account can be used in many different groups. On the forum I'll address support issues as well as post announcements about new releases, known issues that are on the to-be-fixed list, etc. Upon registration, please use a display name consisting of your first name and your call - such as 'Dan AE9K'. Since I already know many of you by your names and calls, this format will help me with the transition from a primarily email-based support model to the forum.